Wednesday, July 25 was the feast day of St. James the Apostle, but St. James' Episcopal Church of Shreveport celebrated a few days early - that is on July 22! Presiding Bishop Katharine Jefferts Schori was in town to consecrate our new bishop, and she preached and celebrated at St. James' Sunday after the consecration. And our own Deacon Bette Jo got to go along! 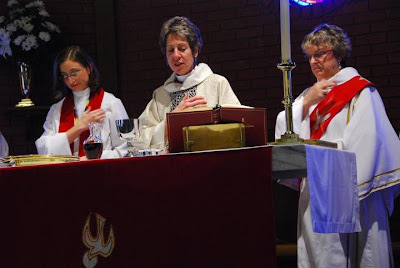 Here is a photo of three women behind the altar at St. James'. They are from left to right, The Rev'd Morgan McIntyre, Rector of St. Jame's, The Most Rev'd Katharine Jefferts Schori, Presiding Bishop and The Rev'd Dr. Bette Jo Kaufmann, Deacon. Note that the three orders of ordained ministry are represented, that is Priest, Bishop and Deacon. Bette Jo said, "It was a glorious day!"